This banded Kettle hat was designed with archers in mind, offering greater openness for better visibility. The hat features a curved brim, as well as a reinforced and riveted band across the meridian line, to help provide greater strength and resilience. 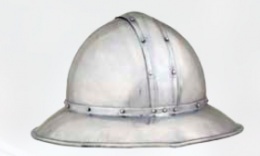 The helmet is made entirely from 16 gauge steel, and it comes complete with an internal liner for comfort. This page was last modified on 26 October 2013, at 18:38.